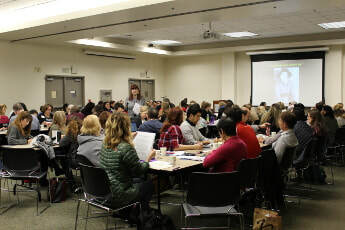 Over 500 educators attended UCI Writing Project's 22nd Annual Literacy Conference for Teachers, held December 13, 2016, at the UCI Student Center. 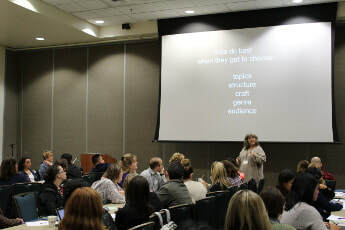 The conference theme was "Teaching Better by Design: Helping Students to Dive Deep as Readers and Writers." 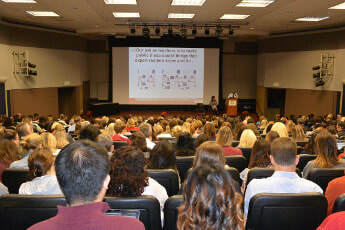 UCI School of Education Dean, Professor Richard Arum, welcomed the educators to UCI. His opening remarks, which included a reference to Bertol Brecht's poem "When Evil Comes Like Falling Rain", centered on the importance of English instruction for preparing students for critical thinking and effective written communication -- essential competencies for not just labor market success, but democratic citizenship. The afternoon keynote address was delivered by Jim Burke (Burlingame High School English Teacher): "Writing Better by Design: We are Teachers, NOT Technicians." 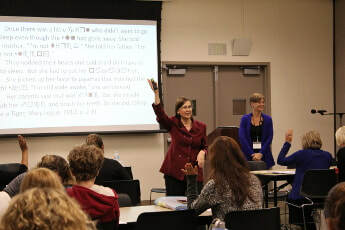 In addition to the yearly literacy conference in December, the UCI Writing Project offers summer programs for teachers and youth. The UC Multicampus Research Programs and Initiatives competition has awarded funding for a UC Consortium on the Developmental Science of Adolescence. Rationale: Multiple biological and social changes make adolescence a key period of developmental transition. Biologically, pubertal processes and brain maturation create heightened emotional lability and reward sensitivity, with a more gradual maturation in cognitive control. Interpersonally, children increasingly replace family time with friend time, pay greater attention to the opinions of their peers, and begin romantic relationships. Structurally, the developmental period spans educational transitions to middle and high school, and for some, to college and the work force. The manner in which these transitions are negotiated – by adolescents, their families, and society – has significant implications for lifelong trajectories of health and well-being. Overshadowed by the national emphasis on early childhood over the past couple of decades, adolescence has re-emerged as a critical developmental period worthy of scientific and public health attention. Historical epidemiological research indicates that experiences during adolescence have perhaps the greatest consequence for adult health and longevity. The University of California Office of the President (UCOP) Multicampus Research Programs and Initiative (MRPI) has funded the proposal to develop the California Science-Based Innovation in Learning (SIL) Center. In the US, 9.2% of public school children are English language learners (ELLs), and ELL enrollment has grown 50% over the past decade, outpacing non-ELL enrollment. In California (CA), a quarter of the school-aged children in the public schools are ELLs. ELLs are twice as likely as non-ELLs to live in poverty and more likely to be misidentified than non-ELLs for learning disabilities (LDs) such as reading disorders (RD). Learning disabilities and their misidentification in ELLs further contributes to ELL inequality in English proficiency and educational attainment, leading to income and health disparity. Reducing education-related risks for poor health outcomes in ELLs requires efforts to better understand the link between educational attainment and health disparity in this population, and early identification of LD in ELLs. Although there are good predictors of RD in English monolinguals, extending these to ELLs is complicated by variability in language experience, lack of English proficiency, variability in the native languages spoken by ELLs, and the lack of normed measures (except Spanish) and qualified practitioners. One third of all US ELLs are in CA, making these issues particularly significant for the state and UC, while at the same time providing the opportunity for UC to be a leader in addressing these issues. The short-term goals of the Center are to: (1) setup an innovative, multicampus, cross-disciplinary collaboration bridging education, cognitive sciences, medicine, and policy, and (2) perform a series of pilot studies to examine the links between academic and health outcomes in ELLs and evaluate individualized prescription of reading interventions that will prepare Center investigatorsto compete for federal center and collaborative research grants in the near future. The long-term goal is for the UC center to be a national leader in "Precision Ed-Health", and tackle issues associated with education and health disparity in underrepresented populations, with an initial emphasis on early identification and intervention of children at risk for learning challenges. The central mission includes performing high quality research and providing training, services, and advocacy. Such efforts will ultimately enhance the lives of children and families, while addressing major issues in CA and the US, including the cost of education, difficulties of educating diverse populations including ELLs, and the health consequences of poor school performance. UC President Janet Napolitano announced the recipients of the 2017 President’s Research Catalyst Awards. The award is a presidential initiative intended to support and highlight exemplary research in strategic areas that benefit UC, California and the nation. New IES Publication: "Teaching Secondary Students to Write Effectively"
The U.S. Department of Education Institute of Education Sciences (IES) has released the 2017 publication Teaching Secondary Students to Write Effectively. The publication is intended to provide educators with the best available evidence and expertise for teaching students in grades 6-12 to write effectively. Starting with an extensive literature review of 3200 citations, 1995 through 2005, which were identified as literature related to secondary writing instruction, research staff added 300 additional studies not included in the original search, then used the What Works Clearinghouse design standards to screen the 3,500 studies for relevance according to specific eligibility criteria. Excluded were studies that did not include populations of interest, measure relevant outcomes, or assessment of replicable practices for teaching secondary writing. From a narrowed selection of 55 studies, 15 were judged to meet the WWC's design standards. Professor Carol Booth Olson's Pathway Project study was one of the 15. Professor Olson also was one of the six expert panel members selected to guide development of the publication. "Assistance or Obstacle? The Impact of Different Levels of English Developmental Education on Underprepared Students in Community Colleges"
Xu, D. (2016). Assistance or obstacle? The impact of different levels of English developmental education on underprepared students in community colleges. Educational Researcher. Developmental education is the most common approach used by community colleges to assist underprepared students for college-level course work. Yet there is limited evidence regarding this strategy on students assigned to the lowest level of the developmental sequence. This paper extends current knowledge on this critical question by examining the impacts of different levels of developmental reading and writing on students’ academic outcomes. The results suggest that the impacts are generally insignificant for students on the margin of needing developmental course work, yet the estimates are negative on students assigned to the lowest level of the developmental sequence. The results therefore support the increasing national push to reform these programs. Schenke, K., Lam, A.C., Rutherford, T., & Bailey, D.H. (2016). Construct confounding among predictors of mathematics achievement. AERA Open,2. DOI:10.1177/2332858416648930. Puts, D.A., Hill, A.K., Bailey, D.H., Walker, R.S., Rendall, D., Wheatley, J.R., Welling, L.L.M., Dawood, K., Cárdena, R., Burriss, R.P., Jablonski, N.G., Shriver, M.D., Weiss, D., Lameira, A.R., Apicella, C.L., Owren, M.J., Barelli, C., Glenn, M. E., & Ramos–Fernandez, G. (2016). Sexual selection on male vocal fundamental frequency in humans and other anthropoid primates. Proceedings of the Royal Society of London B: Biological Sciences, 283. DOI:rpsb.20152830. Evans, B.J., Baker, R.B., & Dee, T. (April 2016). Persistence patterns in Massive Open Online Courses (MOOCs). The Journal of Higher Education, 87(2), 206-242. Schuck, S., Emmerson, N., Ziv, H., Collins, P., Arastoo, S., Warschauer, M., Crinella, F., & Lakes, K. (2016). Designing an iPad App to monitor and improve classroom behavior for children with ADHD: iSelfControl feasibility and pilot studies. PLoS One 11(10): e0164229. DOI:10.1371/journal.pone.0164229. Duncan, G., Magnuson, K., Kalil, A., & Ziol-Guest, K. (2016). The importance of early childhood poverty. Social Indicators Research, 108(1), 1-12. Moeller, J., Dietrich, J., Eccles, J.S., & Schneider, B. (in press). Passionate experiences in adolescence: Situational variability and long-term stability. Journal of Research on Adolescence. Eccles, J.S., & Wang, M-T. (2016). What motivates females and males to pursue careers in mathematics and science? International Journal of Behavioral Development, 40(2), 100-106. Jiang, S., Schenke, K., Eccles, J.S., Xu, D., & Warschauer, M. (2016). Females' enrollment and completion in science, technology, engineering, and mathematics Massive Open Online Courses. Computers and Society. Miller, E., Farkas, G., & Duncan, G. (2016). “Does Head Start differentially benefit children with risks targeted by the program’s service model?” Early Childhood Research Quarterly, 34, 1–12. Morgan, P., & Farkas, G. (2016). Are we helping all the children that we are supposed to be helping? Educational Researcher, 45(3), 226-228. Morgan, P.L., & Farkas, G. (2016). Evidence of minority under-representation in special education and its implications for school psychologists. NASP Communique, 44(6), 30-32. Ramani, G.B., Jaeggi, S.M., Daubert, E., & Buschkuehl, M. (in press). Domain-specific and domain-general training to improve kindergarten children’s mathematics. Journal of Numerical Cognition. Jenkins, J., Farkas, G., Duncan, G., Burchinal, J., & Vandell, D.L. (2016). Head Start at ages 3 and 4 versus Head Start followed by state Pre-K: Which is more effective? Educational Evaluation and Policy Analysis, 38(1), 88-112. Thompson, J., Hagenah, S., Kang, H., Stroupe, D., Braaten, M., and Colley, C. (2016). Rigor and responsiveness in classroom activity. Teachers College Record, 118(5). Kim, Y.S., Qian, G., Liu, L., & Yang, L. (2016). Does previewing answer-choice options improve performance on a reading test? Reading and Writing: An Interdisciplinary Journal, 29, 745. Missakian, I., Olson, C.B., Black, R., & Matuchniak, T. (2016), Writing center efficacy at the community college: How students, tutors concur and diverge in their perception of services. Teaching English in the Two-Year College, 44(1), 57-78. Olson, C.B., Scarcella, R., & Matuchniak, T. (2016). The write stuff. Educational Leadership, 73(5), 38-44. Reich, S.M., Yau, J.C. & Warschauer, M. (2016). Tablet-based eBooks for young children: What does the research say? Journal of Developmental and Behavioral Pediatrics, 37(7), 585-591. DOI:10.1097/DBP.0000000000000335. 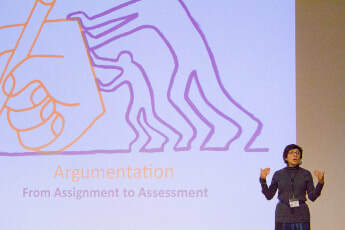 Santagata, R., & Yeh, C. (2016). Characterizing beginning teachers’ competence and its role in professional decisions and practices. ZDM, the International Journal of Mathematics Education, 48(1), 153-165. Delgado, M., Ettekal, A.V., Simpkins, S., & Schaefer, D. (2016). How do my friends matter? Examining Latino adolescents' friendships, school belonging, and academic achievement. Journal of Youth and Adolescence, 45(6), 1110-1125. Tunney, J.W., & van Es, E.A. (2016). Using video for teacher educator professional development. The New Educator, 12(1), 105-127. Vandell, D.L., & Lao, J. (2016). Building and retaining a high quality professional staff for extended education. International Journal of Research on Extended Education, 4(2), 42-65. Vandell, D.L., Simzar, R., O’Cadiz, P., & Hall, V. (2016). Findings from an afterschool STEM learning initiative. Journal of Expanded Learning Opportunities, 1(3), 7-26. Casasola, T.S., Schenke, K., Nguyen, T., & Warschauer, M. (in press). Can flipping the classroom work? Evidence from undergraduate chemistry. The International Journal of Teaching and Learning in Undergraduate Education. Yim, S., & Warschauer, M. (in press). Web-based collaborative writing in second language (L2) contexts: Methodological insights from text mining. Language, Learning, and Technology. Park, Y., & Warschauer, M. (2016). Syntactic enhancement and second language literacy: An experimental study. Language, Learning, & Technology, 20(3), 180-199. Lee, H., Warschauer, M., & Lee, J.H. (in press). The effects of concordance-based electronic glosses on L2 vocabulary learning. Language, Learning, & Technology. Warschauer, M. (2016). Leading the way for open access research. Language, Learning, and Technology, 20(2), 155-158. Reimer, L.C., Schenke, K., Nguyen, T., O'Dowd, D.K., Domina, T., & Warschauer, M. (2016). Evaluating promising practices in undergraduate STEM lecture courses. The Russell Sage Foundation Journal of the Social Sciences, 2(1), 212–233. Lin, C.-H., Warschauer, M., & Blake, R. (2016). Language learning through social networks: Perceptions and reality. Language, Learning and Technology, 20(201), 124-147. Gong, X., Xu, D., & Jan, W.-J. (2016). The effects of preschool attendance on adolescent outcomes in rural China. Early Childhood Research Quarterly, 37(4), 140-152. Connor, C.M. (Ed.) The cognitive development of reading and reading comprehension. New York: Routledge. Gottfried, M., Conchas, G.Q. (2016). When school policies backfire: How well-intentioned measures can harm our most vulnerable students. Boston: Harvard Educational Press. Finocchio, S., Najmanovich, D., & Warschauer, M. (2016). Los diversos mundos en el mundo de la escuela [Diverse worlds in the world of schooling.] Buenos Aires: Gedisa. Connor, C.M. (2016). Using cognitive development research to inform literacy instruction and improve practice in the classroom. In C.M. Connor (Ed.) The cognitive development of reading and reading comprehension (pp. 166-185), New York: Routledge. Connor, C.M., Mansion, A.D., & Duncan, G. (2016). Policy and community influences on learning to read. In C.M. Connor (Ed. ), The cognitive development of reading and reading comprehension (pp. 149-165). New York: Routledge. Connor, C.M., & Weston, J. (2016). Introduction to the cognitive development of reading. In C.M. Connor (Ed. ), The cognitive development of reading and reading comprehension (pp. 1-13), New York: Routledge. Russell, D., & Connor, C.M. (2016). Memory and learning to read. In C.M. Connor (Ed.) The cognitive development of reading and reading comprehension (pp. 53-66), New York: Routledge. Wynne, H., & Connor, C.M. (2016). Self-perception and perspective taking: How beliefs about oneself and others may influence reading. In C.M. Connor (Ed.) The cognitive development of reading and reading comprehension (pp. 100-110), New York: Routledge. Iloh, C. (2016). For-profit universities. In K. Lomotey (Ed. ), Education K-12 and higher education, (volume in the series People of color in the United States: Contemporary issues in education, work, communities, health, and immigration). Santa Barbara, CA: ABC-CLIO/Greenwood Press. Katz, B., Jones, M., Shah, P., Buschkuehl, M., & Jaeggi, S.M. (2016). Individual differences and motivational effects. In T. Strobach & J. Karbach (Eds. ), Cognitive training: An overview of features and applications (pp. 157-166). Berlin: Springer. Kim, Y.-S.G., & Pilcher, H. (2016). What is listening comprehension and what does it take to improve listening comprehension? In R. Schiff & M. Joshi (Eds. ), Handbook of interventions in learning disabilities (pp. 159-174). New York: Springer. Reich, S.M., Bishop, B., Carolissen, R., Dzidic, P., Portillo, N., Sasao, S., & Stark, W. (2016). Catalysts and connections: The (brief) history of community psychology throughout the world. In Handbook of community psychology. Washington, DC: American Psychological Association. Santagata, R., Jovel, J., & Yeh, C. (2016). Learning to unpack standards-based mathematics teaching through video-based group conversation. In P.G. Rossi & L. Fedeli (Eds. 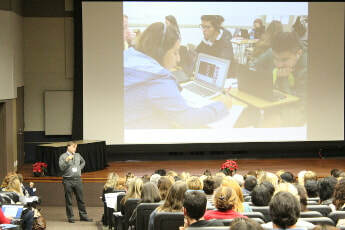 ), Integrating video into pre-service and in-service teacher training (pp.115-127). Hershey, PA: IGI Global. Lin, A.R., Ettekal, A., & Simpkins, S. (2016). Expectancy value models. In R.J.R. Levesque (Ed. ), Encyclopedia of adolescence (pp.1-8). New York: Springer. Warschauer, M. (2016). Addressing the social envelope: Education and the digital divide. In C. Greenhow, J. Sonnevend, & A. Agur (Eds.) Education and social media (pp. 29-48). Cambridge MA: MIT Press. Yim, S., & Warschauer, M. (2016). CALL and electronic media. In K. Hyland & P. Shaw (Eds. ), Routledge handbook of English for academic purposes (pp. 592-607). London: Routledge. Xu, D., & Fletcher, J. (2016). Understanding the relative value of alternative pathways in postsecondary education: Evidence from the State of Virginia. In M. Shah & G. Whiteford (Eds. ), Bridges, pathways, and transitions: International innovations in widening participation (pp.227-259). Cambridge, MA: Chandros Publishing. Kim, Y.–S.G., Boyle, H., Zuikowski, S., & Pooja, N. (2016). The Landscape Report on early grade literacy skills. Washington, DC: USAID. Olson, C.B., Graham, S., Fitzgerald, J., Friedrich, L., Greene, K., & Kim, J.S. (2016). 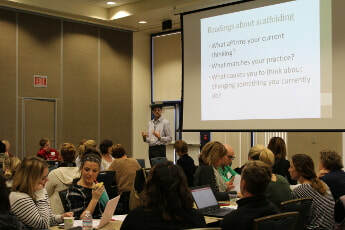 WWC: Teaching secondary students to write effectively. Technical Report: NCEE 2017-4002. Vandell, D.L., Simzar, R., O’Cadiz, P., & Hall, V. (2016). The Power of Discovery: STEM2 evaluation final report. Submitted to the California Department of Education and the STEM Funders Network. Xu, D., Jaggars, S.S., & Fletcher, J. (2016). How and why does two-year college entry influence baccalaureate aspirants’ academic and labor market outcomes? CAPSEE working paper (Research Report). 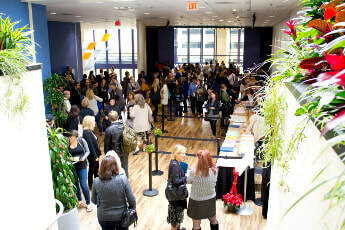 New York: Columbia University Teachers College, Community College Research Center. Xu, D., & Ran, X. (2016). Noncredit education in community college: Students, course enrollments, and academic outcomes (Research Report/CCRC Working Paper). New York: Columbia University Teachers College, Community College Research Center.